Okay, so you’ve mastered the art of grinding your beans yourself and making the perfect brew using a fancy antique coffee siphon. Perhaps your latte art is the envy of all your friends. But how about home-roasting your coffee beans? Now, that’s impressive.Yep, home-roasting is where it’s at right now my coffee-loving friend. But surely roasting your own is going to be a huge hassle? Not so. Although, you do need some know-how and one surprising tool: a popcorn popper. As you know, the perfect cup of Joe starts with the berries of the coffee plant. The beans are first harvested (often by hand), stripped of their outer flesh, sorted, graded, and washed. The beans are then dried. The green coffee is roasted. During roasting, the temperature inside the beans is elevated to around 3920F. As the beans become hot, the starch they contain breaks down to form simple sugars, caramelizing the beans and changing their color to brown. The longer the roasting time, the darker the final roast will be. The length of roasting time significantly influences the final flavor of the brew the beans will give you. It’s the oil that’s produced during roasting that’s responsible for most of the coffee’s flavor and aroma. Why roast your coffee beans yourself? Most coffee connoisseurs will already know that you can buy green, unroasted coffee beans. Roasting green beans at home gives you the ability to create your very own custom blend, based on a combo of your favorite beans and preferred roast. And you don’t need an industrial grade coffee roasting machine to perfect your roast. You can do the job on a much smaller scale in your own home, using a popcorn popper. Who knew? Yes, that’s right. A popcorn popper is the preferred tool for home-roasting green coffee beans. Using a popcorn popper to roast the beans allows you complete control over the roast. You can roast your beans as dark or as light as you like! And the kit you need is relatively inexpensive and very easy to source. Now, as usual, your coffee-loving friends here at Roasty have your back when it comes to choosing a suitable popcorn popper for roasting coffee. We’ve taken time out to review five of the best popcorn poppers that are suitable for home roasting coffee. Check out our reviews, and then take the time to read the educational section to find out how to use your new purchase and produce your perfect custom roast! The Wabash Valley Farm’s popcorn popper is Amazon’s choice and one of their best-sellers. It’s great for roasting coffee too! The popper is lightweight and easy to move around, but it’s made from stainless steel, rather than aluminum. That means that the beans will heat more quickly and evenly than in other roasters. This popcorn popper allows you to roast up to 1.5-pounds of green coffee beans per batch. The stirring handle is well-made and comfortable to use. The lid is tight and secure so that it won’t come open mid-roast. Timing is tricky until you master the process because of the lid issue. You’ll need to stir the pot during roasting continually. 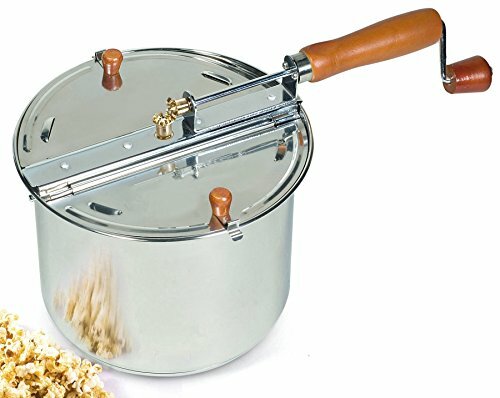 The Zippy Pop popcorn popper is sturdy and well-made from non-stick aluminum. The unique tumbling mechanism means that the beans are continually rotated, ensuring an even roast. The stirring arm negates the need for you to stand stirring the pot for the entire roasting time. The stove-top design means you can accurately control the temperature of the roast. The non-stick surface makes clean-up quick and easy. The glass lid allows you to monitor the color of your roast throughout the process. The only real issue with this popcorn popper is that the stirring blades don’t quite reach the edge of the pot, leaving some beans unstirred. 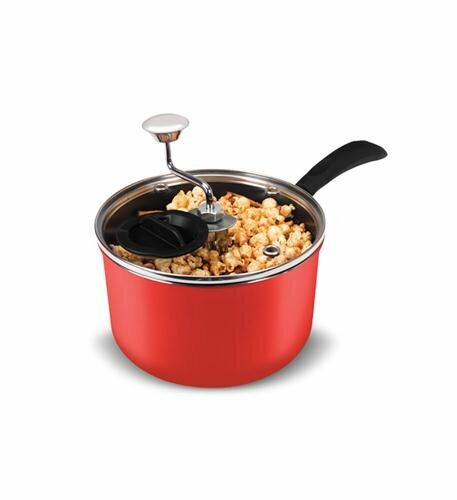 This Cook N Home’s stovetop popcorn popper is a sturdy, robust piece of stainless steel kit that’s built to last. 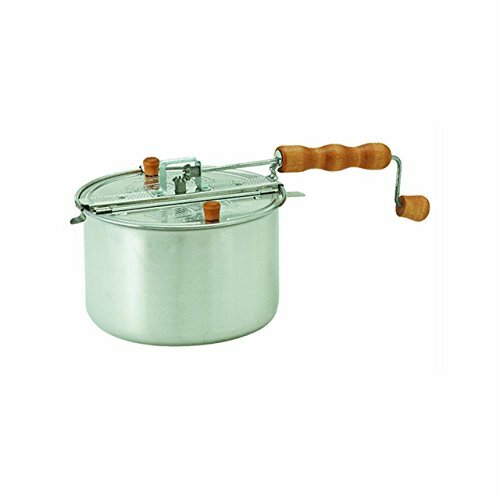 The stainless steel heats the contents of the pot evenly, creating an even roast. The lid is lockable and secure. The huge 6.5-quart capacity of this popper is perfect for making large batches of coffee. Although we love this popper, it doesn’t have a clear lid, so it’s tricky to monitor your roast. The extra-large 6-quart capacity of this aluminum kettle pan is perfect if you want to roast your coffee in large batches. The non-stick interior makes clean-up quick and easy. The pan heats up quickly and evenly to give an even roast. The lid has a wooden stirring handle, so you won’t risk burning your fingers. The pan doesn’t have a transparent top, so you have to lift the lid to monitor the color of your roast. Also, the lid is a tad insecure and does tend to pop up easily. The Great Northern popcorn spinner has a generous 5-quart capacity that’s perfect for making large batches of roasted beans. The pot also has a unique spinner that effectively stops the coffee beans from burning as they roast. Plus, it heats up quickly. The quirky spinner device, large capacity, and the even roasting effect are exceptional. The handles are wooden, keeping your hands safe from accidental burning. The pan is non-stick so is very quick and easy to wipe clean. The lid is not transparent, so you can’t keep an eye on your beans as they roast. Also, the gears that drive the spinner are made from plastic, so there’s a worry that they could wear out more quickly than metal components. 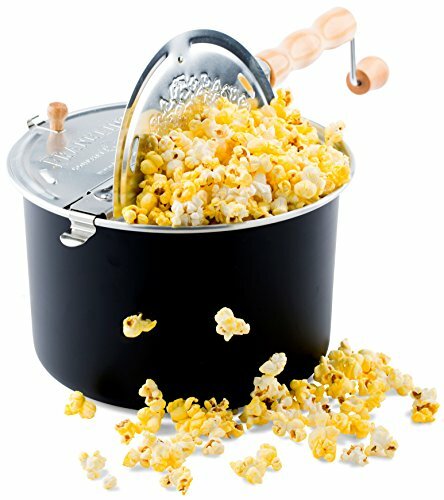 What type of popcorn popper is best for home roasting? So, the razor-sharp baristas amongst our readers will have spotted that all the popcorn poppers we’ve included in our list are stovetop models. There are four main types of popcorn poppers that can theoretically be used for home roasting coffee beans. A hot air popcorn popper can be used for roasting coffee beans. These devices are relatively inexpensive to buy, and you don’t need to stand and stir the coffee continually during the roasting process, as you do with some other types of poppers. The main drawback of this type of popper is that most of them fail to reach a hot enough temperature to roast your beans properly. Also, these devices were not designed for roasting coffee, and some have been known to catch fire! Now that’s a very dark roast indeed. Stovetop poppers are pretty close to the industrial grade machines that professional roasters use. That’s why we prefer them to any other popcorn popper design. Stovetop poppers allow you to control the temperature inside the pan accurately. Many have clear lids too so you can monitor the beans as they roast and watch the color change. You have total control over the stirring speed of the beans in the pan, ensuring an even roast. Clean-up is quick and easy thanks to the non-stick surface of most stovetop popper pans. The only real disadvantage of a stovetop popper is that you have to stand by and monitor the roasting beans throughout the process. However, the delicious aroma of roasting coffee more than makes up for this small inconvenience. Electric poppers are pretty popular among home roasters. They’re self-stirring, easy to clean, and they maintain a consistent temperature each time you use them. However, there are a few disadvantages to electric machines. The main issue is that they have only one temperature setting, which is usually too low for roasting coffee beans. Also, the automatic stirring arms tend to trap the beans, which then scratch and damage the pan’s Teflon non-stick coating. Although your microwave is a very convenient appliance for many processes, it’s not suitable for roasting coffee beans. Microwave popcorn poppers do not heat the beans evenly so you can end up with some beans in the batch burnt to a crisp and others undercooked. While the popper is in the microwave, you can’t stir the beans, leading to an uneven roast. Additionally, microwave poppers are made from plastic. That means that you can’t use the high temperatures required for roasting coffee, and the plastic can give the beans an unpleasant taste too. So, that’s why we always recommend using a stovetop popcorn popper for home roasting your coffee beans. Okay, now you’ve ordered your popcorn popper, and you have your green coffee beans, what next? Roasting coffee beans in a popcorn popper is not as difficult as you might think. Here’s how to do it. Make sure that you set up your popper somewhere well-ventilated such as under your stove vent hood or close to an open window; things could get smoky. 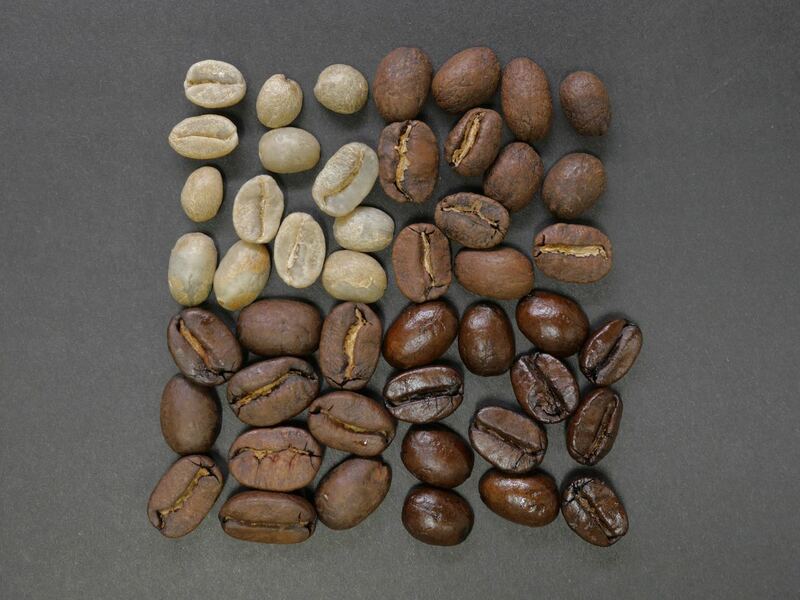 Measure out your green coffee beans. It usually works best to use the same measurement that’s recommended by the popper manufacturer for popcorn. Follow the popcorn popper’s instructions for starting the popper and loading it with your coffee beans. About three to five minutes into the roasting process, you should begin to hear cracking sounds from within the popper. When the cracking stops, the coffee is lightly roasted. You can leave it to roast for longer if you want a darker, more intense flavor. Monitor the beans carefully; one minute too long and your perfect roast will likely turn to ashes. When the beans are almost ready, turn off the heat. Pour the roasted beans into a metal colander. Hold the colander over your cardboard box and toss the beans in the air to get rid of the chaff. Place the coffee beans in an open container to rest for a couple of hours. Resting lets the coffee to “breathe” and allows any gasses to evaporate. Once the coffee beans are cool, place them in airtight containers. Note: you can freeze the coffee if you want to preserve its freshness. And breathe … you have just successfully roasted your first batch of coffee beans! So, you see, roasting coffee beans at home using a popcorn popper is pretty straightforward, once you’ve had a little practice. Check out the stovetop poppers we’ve reviewed, get yourself one, sort yourself some super-quality green coffee beans, and roast away. French Press vs. Drip Coffee – Which Brewing Method Is Best For You? So you have heard of chicory coffee. But do you know what chicory coffee is? And, more importantly, do you know how to make it? And why would you even want to make it? Using our definitive guide to roasting coffee at home, you can learn how to create the perfect cup of coffee yourself from start to finish. All you want is a cup of coffee, and your Keurig has an error message that says Prime. Before you throw it out the window, here's a step by step guide to priming your Keurig machine. You have the right grinder, a great maker, and your favorite mug. Now take the next step to true coffee connoisseur-dom. Get a coffee roaster, and roast your own beans at home.